From use in flooring and backsplashes to accenting pottery and exterior walls, tile applications are a versatile home decorating solution. Villagio Tile provides the Greater Phoenix area with high-quality decorative tile in every style, color and finish. Turn your design idea into a reality including porcelain tile, glass tile, wood porcelain tile, ceramic tile, and more. Glass Tile – Glass tile is commonly used for mosaics and feature walls, as well as on kitchen and bathroom splash backs. Glass can be created in a variety of colors and styles and its distinctive, semi-reflective appearance will create a dramatic effect wherever you choose to place it. Durable glass tile is resistant to sunlight, heat, water, and frost and can be used both indoors and outdoors. Porcelain Tile – Porcelain is one of the strongest tiles available. Because the clay is fired at temperatures upwards of 2,200-degrees Fahrenheit, it is up to four times more durable than traditional glazed tiles. Porcelain is water resistant and stain resistant, and it comes in rough, plain and glazed varieties. Install this type of tile as flooring, kitchen and bathroom countertops, on walls, backsplashes, showers, and even outdoors. Mosaic Tile – As if glass and porcelain tile weren’t versatile enough, the possibilities for mosaic tile are only limited by your imagination. Decorate a huge planter pot outside, beautify your staircase, create a decorative piece above your kitchen counters, or design a beautiful picture at the bottom of your swimming pool. Mosaic tiles are usually no more than six inches in diameter and are available in various sizes, shapes, patterns, and finishes. They are extremely easy to install and can be used indoors or outdoors. 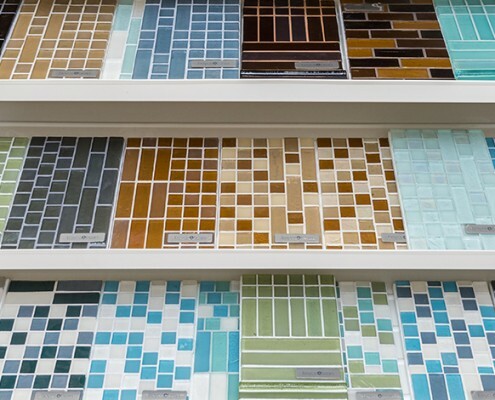 Come visit your showroom today to see all the different tile options available in Phoenix and Scottsdale residents!